Brilliant efficient service. Hamish confirmed the appointment by text and turned up on time. Really helpful and willing to sort the problem. I felt he was completely trustworthy and would not hesitate to recommend or use again. A really good find. Great service. Fitted me in same day for radiator valve replacement, which was done quickly and to an excellent standard. I will certainly use him again in future for minor plumbing jobs. Hamish has solved two plumbing problems for us and he has been excellent. He is totally professional and competent and we have total confidence in recommending him. Prior to finding Hamish we used another local plumber and he was unable to complete the job whereas Hamish dealt with it proficiently and to a very high standard. He is courteous and pleasure to have in the house. Fantastic service, clear pricing and an Excellent Job! £50 for up to an hour, then £40 per hour in 15 minute increments. Payment by online transfer within 7 days, or by cheque or cash. Mainly Monday to Friday, 8am to 6pm, but please call any time. For detailed guidance on each of these, please see my Pricing page. Because I focus on the small jobs, I can often fit another into my day, so please try calling me if you have a small plumbing emergency. I often hear it said, “You can’t find a plumber to do the small jobs”, or “You can’t find a plumber when you need one”. I try to fill these two needs of small jobs and availability without too long a wait. I especially fix toilets and taps, but also deal with shower problems, leaks, blockages and the like. Not being a gas plumber, I don’t do boilers. I arrive at a job with an expectation of fixing the problem and charge according to my published hourly rate. That way you pay for how long the job actually takes, and I never overcharge. I carry a good stock of common plumbing parts in my van which helps me provide an efficient service. More often than not I am able to complete the job without having to go and buy parts, which minimises my labour charge. According to my reviews, many people are impressed by how efficiently I work and get the job done. For detailed price guidance, please see my pricing page. 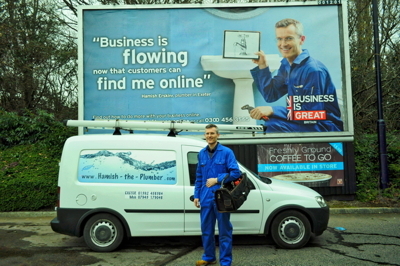 Nigel Wyatt, 07877 110678 - General plumber, Gas safe, but like me prefers to focus on small plumbing repairs. Dyno-Rod Drains, 01392 461043 - Drain specialists - I don’t know them personally, but if you have a serious drain problem expect them to have specialist drain-unblocking equipment beyond what a normal plumber usually has. Having said that, I am fairly well equipped for drains myself, and I recently unblocked drains at a property where Dyno-Rod had given up and told the customer to call a plumber! Although I do provide emergency plumbing repairs, as a sole trader, my availability is limited. If you have an emergency and neither me nor any of the above are available, try searching for ‘plumbers exeter’ on Google Maps and work your way down the list. The advantage of using Google Maps, as opposed to the main Google page, is that the plumbers listed should be genuine local plumbers, and not national firms pretending to be local with 01392 virtual phone numbers.